BOMAG's BTM 05 Terrameter compaction control and documentation system measures, controls and records the compaction process and its development, leading to significantly increased compaction quality. The system is ideal for proof rolling of subgrade and identification of weak spots in landfill liner construction. The Terrameter overcomes the shortcomings of conventional test methods by continually measuring stiffness, settlement, deformation and load-bearing capacity of soil and granular materials, eliminating the risk of under- or over-compacting. Through the indication of Omega values, the Terrameter provides assurance of uniform compaction quality without the delay of laboratory testing. Because conventional test methods are applied at sample points, they only provide partial control. By assessing the entire area, the Terrameter reduces the risk of under- and over-compacting. As the Terrameter passes across the ground, the measuring system continually produces an Omega value, a measurement of compaction quality. Depending on the material type, Omega values between 0 and 1,000 will be indicated. The higher the Omega value (relative to material type), the better the compaction. During each measuring pass, the Terrameter calculates the average Omega value and compares it with previous passes. Poorly compacted spots, represented by low Omega values, can be identified and located on a printout, and may then be further compacted. A green indicator light on the control panel indicates the roller is compacting effectively. If the required Omega value is achieved before the green light goes out, the operator may finish compacting the area and print the results. If the average Omega value increasing between two passes is minimal, the green light will go out, signifying that maximum economic compaction has been attained. The Terrameter can be field or factory installed to all models of the BOMAG BW213-3 Series units, as well as the BOMAG BW219DH-3 model. For more information on the BOMAG BTM 05 Terrameter, contact Compaction America, Inc., a United Dominion Company, 2000 Kentville Road, Kewanee, IL 61443, call 309-853-3571, fax 309-852-0350, e-mail info@compactionamerica.com or visit the BOMAG web site at www.bomag-americas.com. 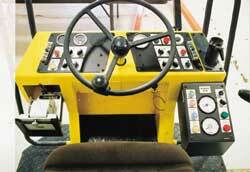 BOMAG , 2000 Kentville Road, Kewanee, IL 61443. Tel: 309-853-3571; Fax: 309-852-0350.